The simpsons stopper (Myrcinathes fragrans) planted at the southwest corner of the Audubon House is flowering copiously. Its fragrant, multi-stamened flowers attract a plethora of pollinators. 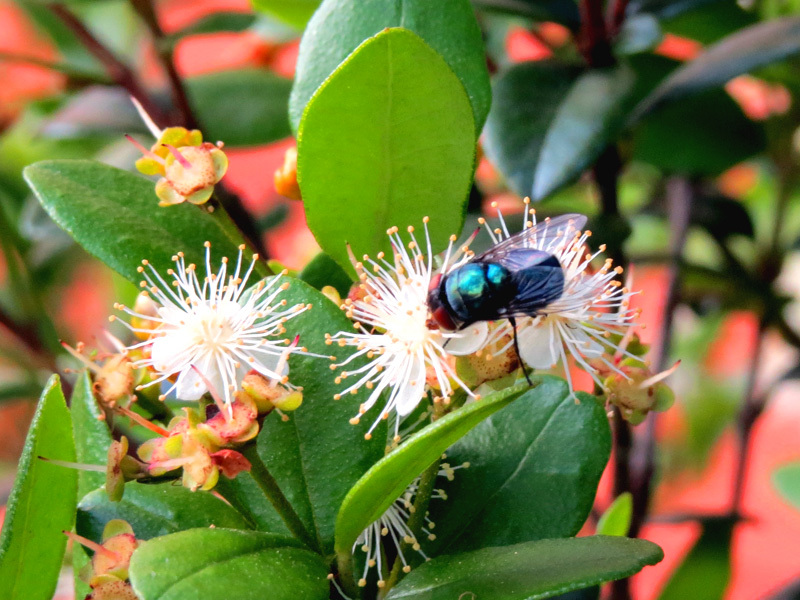 Upon it was a metallic blue-green fly, likely a hairy maggot blowfly (Chrysomya rufifacies), according to Roxanne Connelly, Florida Medical Entomology Laboratory (FMEL). A forensic study (think dead & decayed road-killed coyote) conducted by Dr. Connelly at FMEL revealed that this insect is the most common decomposer fly in the area. Once her paper is published, you can read all about it. In the upper left corner of this photo you can see flowers on their way to becoming juicy, red fruits beloved by birds and other fruit-eating critters. 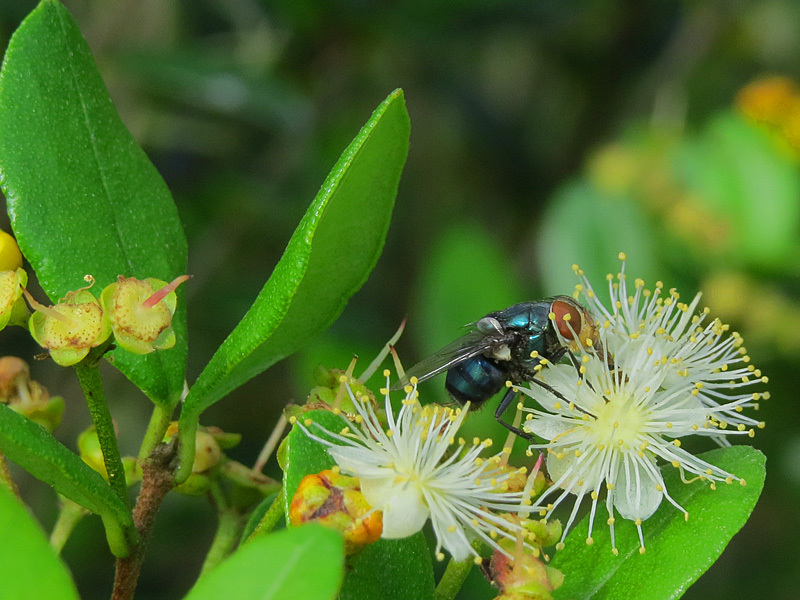 Yes, ‘pretty’ pollinators like butterflies & bees, also visit simpsons stopper, but this plant does seem to be especially attractive to flies, including the not-so-beloved love bugs (Plecia nearctica). Ruth and Bob Inhoff (Class of 2013) report that their simpsons stoppers are ‘mobbed’ by love bugs. 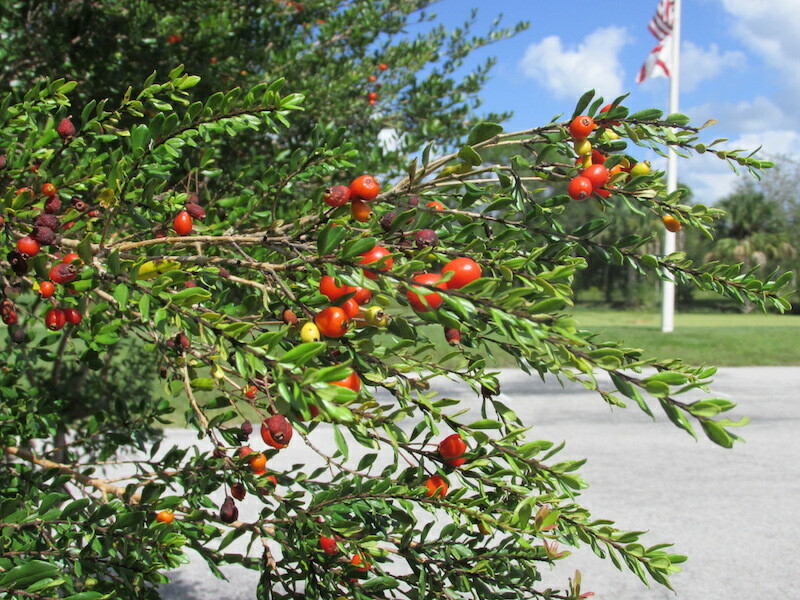 The simpsons stoppers at the Indian River Mosquito Control District office, recommended as landscape plants by Jim Haeger years & years ago and pictured below, flourish and do attract bevies of love bugs. 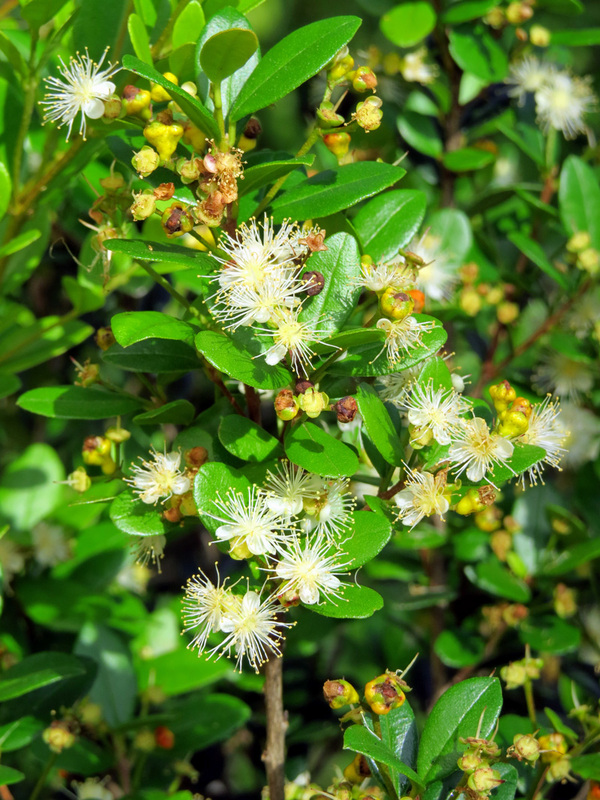 Dr. Ronald Cherry at the Everglades Research and Education Center, found that yellow and white are the colors most attractive to love bugs and that they are drawn to a floral compound called phenylacetaldehyde, which, I would guess, is present in the flowers of simpsons stoppers. Click here to learn more about his love bug trap trials.